• A striking piece of art by Adam Boulter will be on display in church with a prayer guide for individual use. • There will be prayer stations in St Catherine’s chapel based on The Lord’s Prayer for individual use. 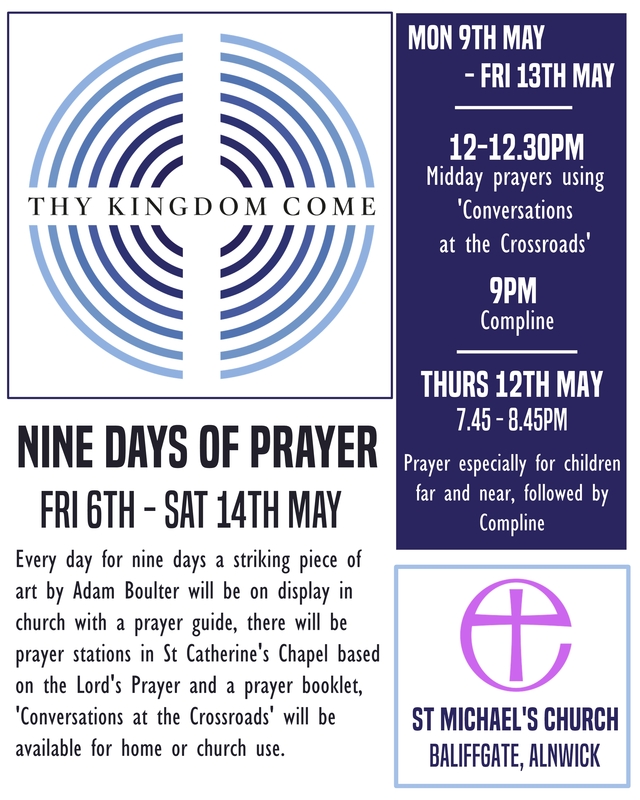 • ‘Conversations at the crossroads’ A booklet including the artwork of Adam Boulter, a bible passage and prayer response. This can be used privately at home or in church. • Join us for Midday prayers 12.00-12.30pm using the ‘Conversations at the crossroads’ booklet . • Join us for the short service of Compline at 9pm in church each evening. • Join us on Thursday 12th May 7.45pm-8.45pm to use the booklet and pray especially for children far and near.Followed by Compline at 9pm.